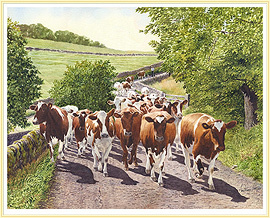 Our company was established in 1966 and with more than four decades of unrivalled reputation in fine art and its presentation, Hood and Broomfield offer an invitation to view its web catalogue and a fascinating display of pictures featuring old times and changing ways of the countryside. 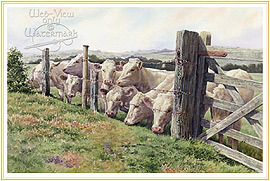 Available as signed limited editions in our most popular choice of framing, packed and courier delivered to your door. a colourful tribute to our Country Heritage. for all who live and work within sight and sound of the working landscape. If you're looking for farming pictures, featuring all aspects of the countryside and our agricultural heritage, you'll find that Hood and Broomfield offer the biggest and best choice of farming pictures in the UK. 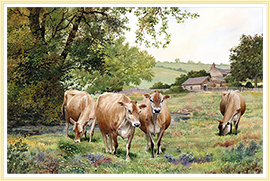 The farming pictures in our wide ranging portfoilo help to recapture those special farming scenes that hold a treasured place in the memory of all who live and work in the countryside. Revisit the years of the horse drawn plough, the vintage tractors of the mid-twentieth century, the livestock and the changing landscape in a unique and exclusive series of farming pictures that record the passing scene in an unforgettable way. Colourful, fascinating, detailed, knowledgeable and informative, these are not only pictorial, but are also accurate recollections of our proud country heritage. 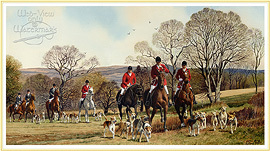 Each magnificent country picture, offers so much more than meets the eye, and all are beautifully reproduced from the highly acclaimed original paintings by one of Britain's finest watercolour artists Anthony Forster. 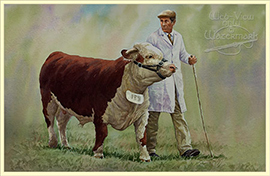 In a lifetime of artistic collaboration with the artist, Hood and Broomfield Fine Art have been proud to publish and present this superbly comprehensive range of farming pictures in their growing series of highly collectable, artist signed and numbered limited edition fine art prints. Each picture creates a lasting impression. Capturing the skills and the spirit of the past, and faithfully recording the best of more modern times, these are farming pictures that will provide the treasured memories of today's farming families and those of generations to follow. with an option to order via our shopping cart and checkout page. 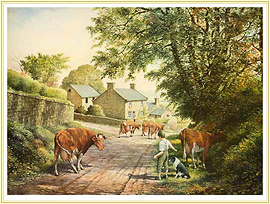 A timeless scene now a classic farming picture, the farmer and his animals heading home for the milking parlour and a well earned dinner. 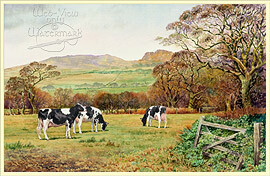 A delightful scene, Ayrshire cows making milk, a farming picture full of colour. 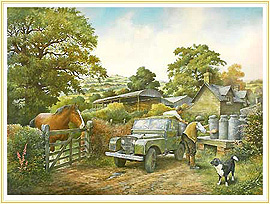 A classic Farming scene on England's country roads. 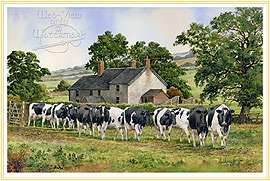 A herd of Friesian cows cross the road, other traffic must give way, these ladies will not be hurried. Jersey beauties taking a well deserved brunch. 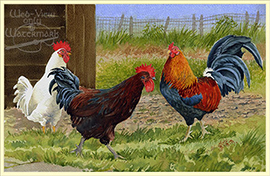 This a new print of chickens and roosters, from a watercolour based on a scene near to where the artist lives in Fair Oaks California . 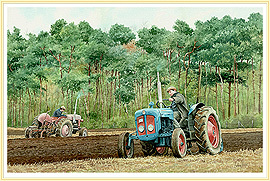 This a new tractor print , from a watercolour painted several years ago before the artist left the UK. 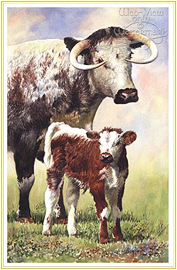 This a new cattle breed print , from a watercolour painted several years ago before the artist left the UK. 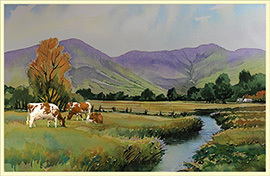 Added to our Gallery Six. 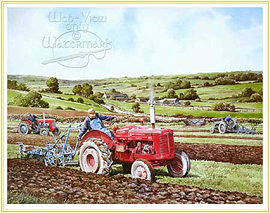 The classic and for many farmers, their original workhorse - A welcome addition to our range of Vintage Tractor pictures. 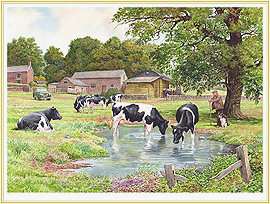 A classic Farming scene. 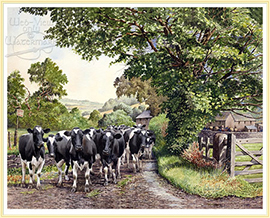 A group of Friesian cows follow the sounds of their nearby companions on the daily stroll down the well worn lane to join the rest of the herd in an adjacent field. 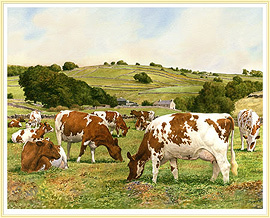 Guernsey Heifers enjoying a seasonal lunch. 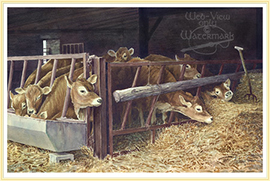 Jersey Heifers dining out . Wearing the distinctive Blue and Red livery. 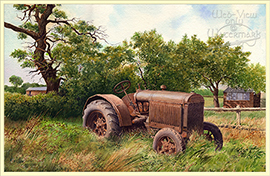 The classic vintage Fordson Dexter - A welcome addition to our range of Vintage Tractor pictures. Wearing the distinctive green and yellow livery. The classic vintage John Deere model AR - battles for control over the hard earth. 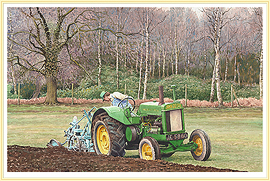 A farming picture of hard work with harder won rewards - the essence of our country heritage. 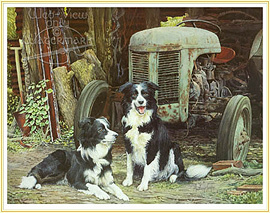 A colourful and welcome addition to our range of Vintage Tractor pictures. 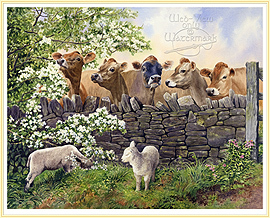 A group of inquisitive Jersey cows enjoy the May blossom and startle two young lambs, a farming picture set to become very popular. 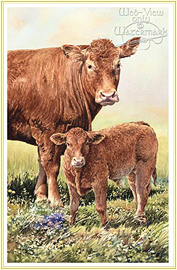 hard work with harder won rewards - the essence of our agricultural heritage. A small boy, under the watchful eye of a proud and happy grandfather, his pride and joy. 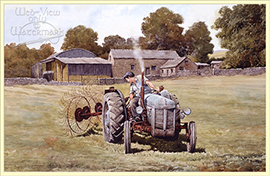 The excited youngster astride his own pride and joy, an old Fordson Major, a fantasy machine, taking him into a dream world of his own making. 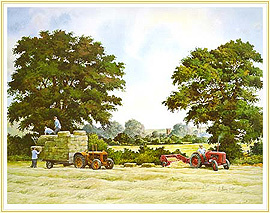 A classic scene in the Farming Calendar. The church bell sounds the time of day, the farmer sounds the time of year. 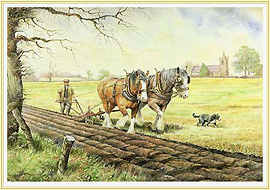 A picture of hard work with harder won rewards - the essence of our country heritage. The Ferguson TE20, well respected and affectionately known as "Little Grey Fergie" here rediscovered resting from its labours in the lee of a well stocked hay barn - awaiting the fates of rust or recovery under the watchful eye of a handsome old Grey Shire. A faithfull collie at his side the farm boy persuades the stragglers of the herd away from the tempting lushness of the roadside greenery. Upper Hulme near "The Roaches" North Staffordshire. 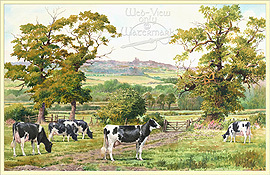 A delightful scene with a view from Moreton Hall Farm towards Mow Cop Castle the famous 18th century folly. 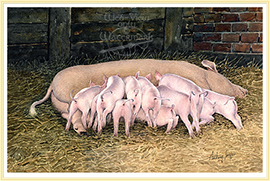 one of a range of Farming Pictures in our new Gallery Six. 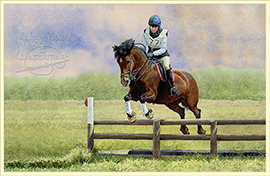 A picture with movement, vitality and colour. 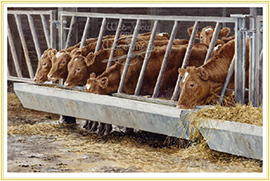 Though not strictly a Farming Picture, the connections with farming are too strong for this image to be left off the farming picture list. We hope you agree. 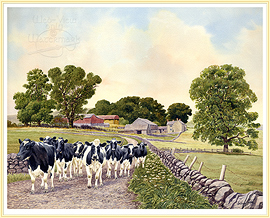 A farming picture to bring back memories, there was always one old cow to slow up the stragglers of the herd, on the way back to the farm. 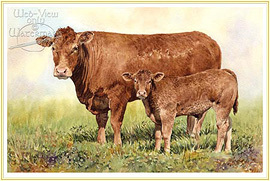 A delightful farming picture, Gloucester cattle, an extremely rare breed. Docile and amenable, an ancient breed dating back to the 13th. 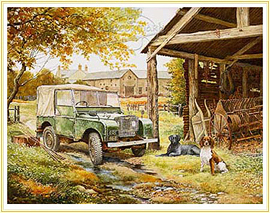 century, a farming picture full of colour a classic scene of our farming heritage. 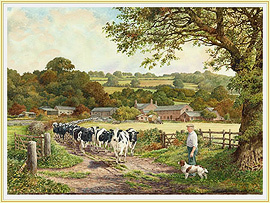 A timeless farming picture the farmer and his trusty companion the border collie, bring in the final few stragglers of the herd, nice and easy - taking the Slow Lane back to the farm. 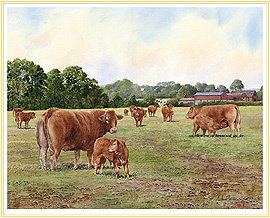 One of the three latest additions to our popular new range of Farming Pictures in Gallery Six..
A limousin suckler herd graze contentedly in the Summer sunshine, moving from field to field never far from the farm buildings of this small, yet successful family business. 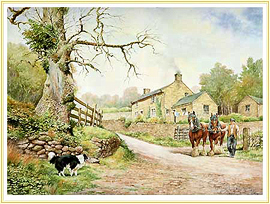 A timeless scene, man and his animals working together to cultivate the land, where the quiet heartbeat of country life can still be heard in the sound of bells carried on the wind from the steeple of a distant church. 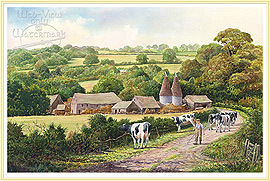 A farming picture from the past. 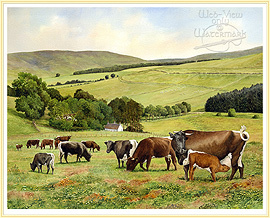 A restful scene, a man with his animals a herd created with heartfelt pride. A farming picture to bring back memories. 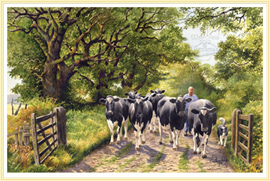 A typical country scene, the herd leaders are through the gate and off home to the parlour, a farming picture full of movement. 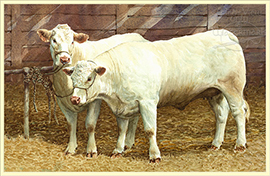 We've all seen this familiar scene while walking through a field or down a country lane, now available as a classic farming picture seen here as a group of Charolais heifers. A stolen moment of relaxation in a quiet corner of the farm. The collie Partners take a welcome break near the rusting retreat of another old friend, the "Little Grey Fergie" of yesteryear. 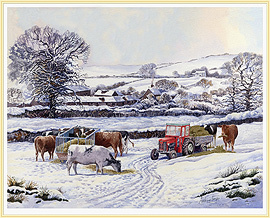 A favourite winter Farming Picture. 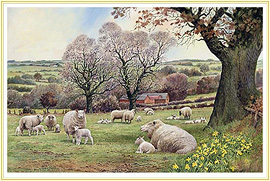 A splash of yellow, fresh green growth and new life - Daffodil time is also the season of new birth on the farm - Lambing Season. And of course a time to remember our Mother. Originally called Mothering Sunday and in the UK is the fourth Sunday in Lent. 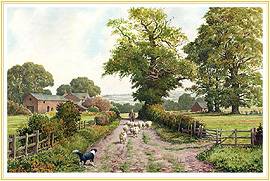 A timeless subject a Shepherd and his dog, moving the flock to a fresh pasture, here it is the Top Meadow. 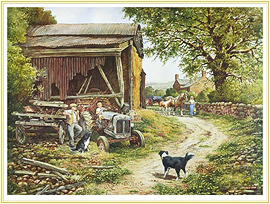 A subject painted by most rural artist's and is a classic Farming Picture. A collie, two shires and their master. (Ivy Cottage Upper Hulme Staffordshire). 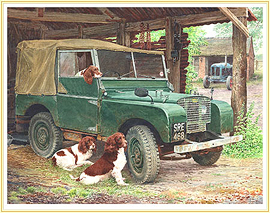 A series 1 Land Rover and a trio of eager springers - play the Waiting Game..
A colourful tribute to a British Institution with a unique place in the affections of countless Land Rover owners, "One of the Family" captures the practical presence and country green livery of the old Series 1. 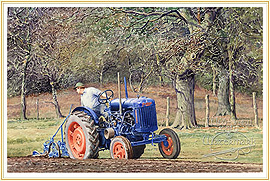 Men and machines at work in the landscape . . a must for vintage tractor enthusiasts and farming families. A fresh day in open country with competing Fergusons against the vigorous challenge of McCormick's contention for the title. 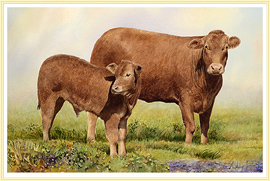 Limousin cow and Calf representing a very popular breed. 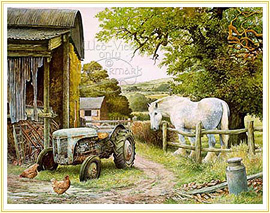 A delightful nostalgic scene, a farming picture full of warm and pleasant memories. Telephone: 01782-626859 ~ or 077 40076799 ~ E-mail: enquiries.